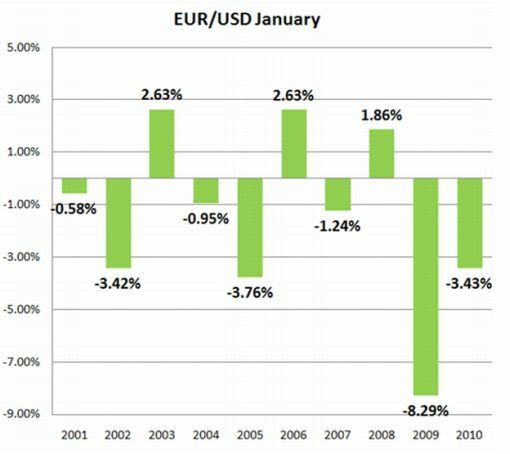 Euro Jan Seasonality – Spot On! At the end of last year, I posted an article on FX360 about the seasonal factors in the EUR/USD during the month of January. At the time, I had said that the euro has a strong historically tendency of falling in January. Although the month is far from over, so far, its been spot on. The EUR/USD started the month at 1.3384 and is now trading around 1.29. Someone pointed out in the comment section of the article that over 40 years, there is no seasonal consistency. Perhaps he is true, but in 7 out of the last 10 years (8 out of the last 11 if you count 2000), the EUR/USD declined and so at bare minimum -- it is not something we should ignore.